I’ll say it time and time again. The secret to sticking to a healthy diet is meal planning. 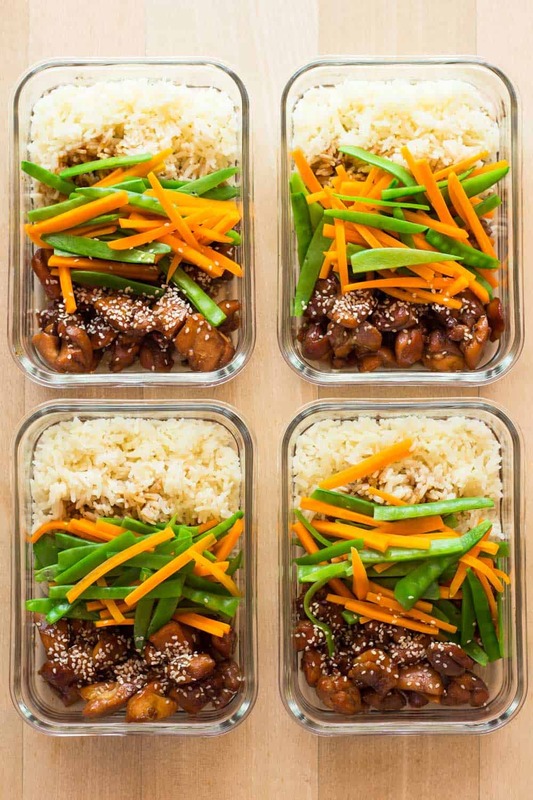 Today I’ve got Vietnamese Chicken Meal Prep Bowls for you to sweeten up your week :) Sweet sticky chicken, rice and veggies! I never buy unhealthy overly processed food so I don’t have it at home and get into the temptation of eating it. That’s a great way to avoid eating unhealthy. However, I’ve noticed that’s not enough to stick to a balanced diet. There are days where I’m so busy I don’t get to cook myself a meal and end up eating nuts for dinner. Nuts are great, sure, but not in huge quantities and certainly not as only food on your dinner plate. Meal prepping has helped loads of binge eaters or compulsive eaters loose a ton of weight (such as my husband). When your meal is ready to eat you are less likely to binge on unhealthy food. It’s not like you will die if you eat unhealthy food every once in a while. The problem is, when you eat unhealthy you usually automatically adopt the “eff it all” attitude and eat waaaay too much of it. If you meal prep, you know where your healthy food is and you know it’s the right amount of food your body needs. 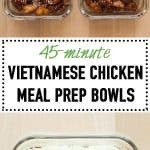 There is one thing you have to consider when preparing meal prep bowls containing chicken. Cooked chicken doesn’t make it a whole week in the fridge. That means you can’t make a chicken meal prep bowl on Sunday to be eaten on Friday. You can however, freeze it if you wish. According to foodsafety.gov you can keep cooked chicken in the fridge for 3-4 days. I don’t risk it with chicken so I prepare 4 meal prep bowls with chicken on Sunday evenings. I’m not an advocate for calorie counting, I am a huge advocate for making sure you get all your macro nutrient in though. Get informed about how much protein and carbs you need. This depends on your height and how active you are throughout the day. Make sure you get enough protein and carbs into your diet to maintain your lifestyle and weight. And most importantly, always, always make sure half your plate is filled with fruits and vegetables. A balanced meal satisfying your macro nutrients with whole foods will automatically become a “weight loss meal prep bowl”. It’s that simple. No need to deprive yourself or start counting calories. Now, if you don’t like eating the same meal 4 days in a row, I totally get you. 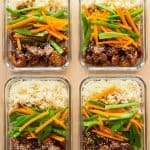 Check out my more sophisticated post about How To Meal Prep to prepare 4 different healthy meal recipes all in one go. When we have to freeze meals or we have to take larger quantities with us someplace and space and weight are an issue, I simply use freezer bags to store the individual parts of my meals separately. They are great for taking your meal prep bowls to your camping trip for the whole family. I'll say it time and time again. The secret to sticking to a healthy diet is meal planning. 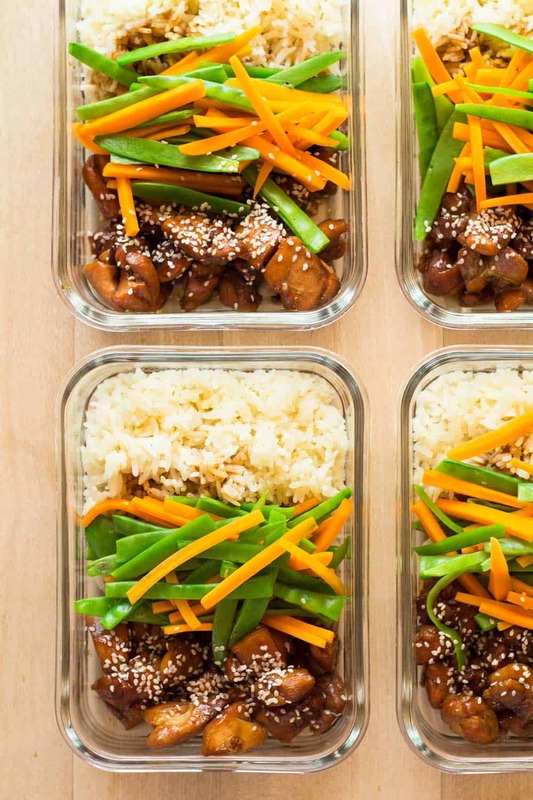 Today I've got Vietnamese Chicken Meal Prep Bowls for you to sweeten up your week :) Sweet sticky chicken, rice and veggies! Cut chicken into cubes and marinate in 2 Tbsp honey, 1 Tbsp fish sauce and 1 Tbsp soy sauce for about 10 minutes. In the meantime, prepare rice with chicken broth instead of water. The amount of broth will depend on the type of rice you use. Follow instructions of the packaging and simply replace water and salt recommendation by broth. If you are a fast veggie chopper, preheat a large pan over medium heat. If you are a slow veggie chopper wait with preheating until after you've chopped one of the two veggies. Peel carrots and cut into thin stripes and cut off ends on sugar snap peas and cut in half vertically. Sautée vegetables in dry preheated pan until desired doneness. For me that's about 3-4 minutes so they stay crunchy and vibrant. Remove vegetables from pan and set aside. Put pan back on burner. Add a splash of oil to the pan and cook chicken cubes IN 2-3 BATCHES (important!). About 2 minutes per side. Remove from pan and set aside. Put pan back on burner. Add honey, fish sauce, soy sauce and rice vinegar to pan and bring to the bowl and let simmer stirring often until sauce thickens a little. Once sauce has thickened add chicken back in and let cook another minute or two. 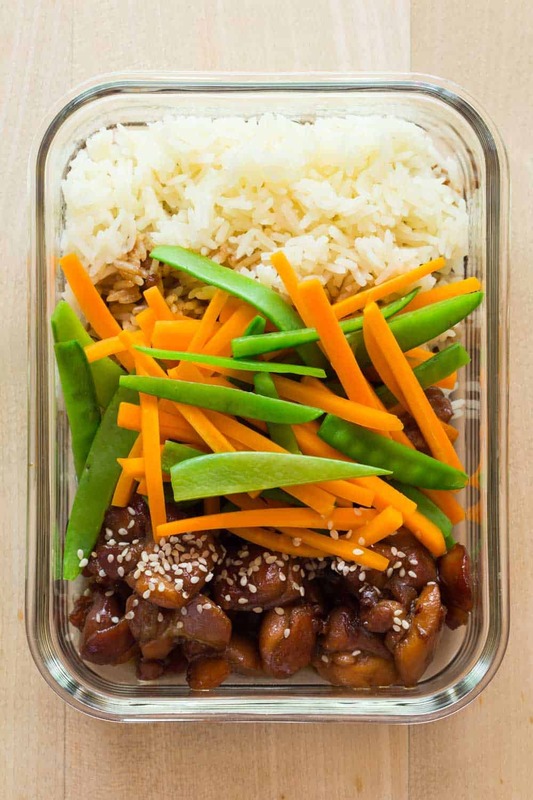 Then start building your bowls by evenly distributing rice, chicken and vegetables in air-tight sealable containers. Sprinkle chicken with sesame seeds, let cool completely. Once cool, seal with lid and store in refrigerator for up to 4 days. Your sauce measurements seem off. Are you suggesting that we cook down the marinate for the sauce? Or is there supposed to be remaining ingredients that make up the sauce? Hi Lindsay, I’m not sure I’m understanding your question and star-rating. You are rating my recipes without having tried it? 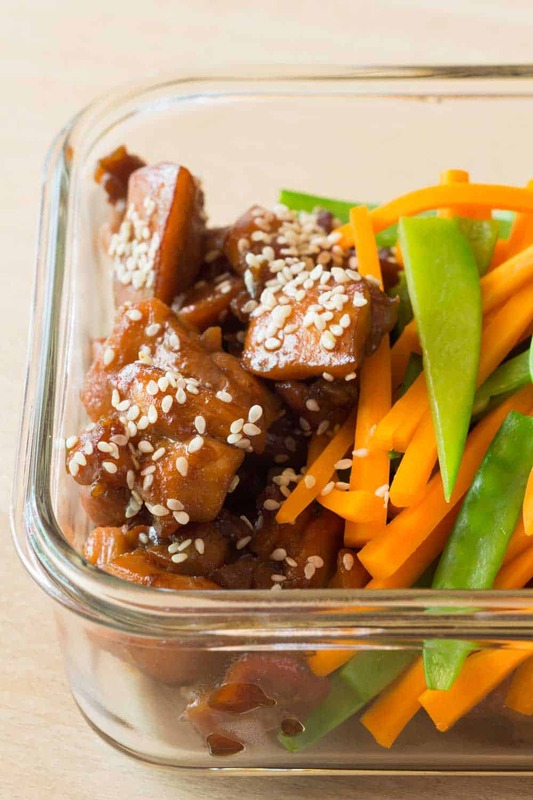 The ingredients and instructions explain that you use 1 Tbsp honey, 1 Tbsp soy sauce, and 1 Tbsp fish sauce as marinate. And then later in the recipe you use, 4 Tbsp honey, 1 Tbsp fish sauce, 1 Tbsp soy sauce, and 4 Tbsp rice vinegar to make the sauce. If that’s not enough sauce for you, you can obviously double the sauce ingredients. Hi Michelle, there are online calculators for that. Unfortunately I don’t know how accurate they are. I’m not a nutritionist so I feel uncomfortable providing this kind of information. I can’t tell if the online calculators are accurate enough. Do you reheat this when you eat it or just eat it cold? I rehear in a pan like a stir-fry, my husband eats it cold. It’s all about personal preference.